Finally caught the last part of the Twilight saga. 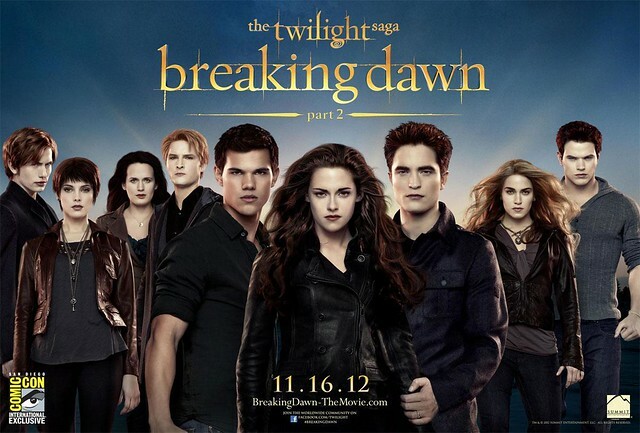 I stand by my views, I like the book, I like the movies, I like Kristen Stewart, and I like this last movie. I don't care what critics say, or what Twilight haters are gonna say, or what Kristen Stewart haters think. Kristen Stewart makes a perfect Bella and I like Twilight. There is this comparison going online between Harry Potter and Twilight, which IMHO, is needless. The only thing they have in common is that they're fiction and they like to talk about supernatural beings. Except Harry Potter puts the focus on magic and Twilight focuses more the development of the supernatural being storyline. I can enjoy both at the same time! There's the added bonus that Bella is now a vampire in this book hohoho, I think she looks fabulous as a vampire instead of as a human. More flawless. More confident. Macho man and his over large ego losing to a supposedly weaker female. Definitely entertaining. I have to add, I think this scene was specifically made to show off macho man's bulging but well-defined muscles. Hehh, lots of well-timed humour in the movie, as demonstrated by said scene above. They've found a great child actress for Renesmee, she looks positively angelic. I love her hair, and they somehow managed to make Bella and her daughter look alike. Amazing. I personally think Alice (Ashley Greene) looks great in this pixie crop! The movie stayed true to the book, which is something that I'm very particular about when it comes to book adaptations. Lots of action, well-timed humour and adequate amount of suspense to leave you wanting more. I especially love the final scene when Bella showed Edward a series of memories from their courtship. Ahh..romantic. All those fantasy-haters or vampire-haters you can skip this. But for me, I think it's pretty worth it.